I've been busy crafting away today, preparing for the big feast on Thusday, which I am hosting this year. In all my 41 years, I've never hosted Thanksgiving or roasted a turkey, but I will be doing it up this year for both sides of our family, which will translate into 16 hungry mouths. I have my menu planned, my course plotted, and today I made some hostess gifts and some pretties for our table. ﻿An Old German Legend tells of the magic of all the world's birds bursting into song, as if with one voice, the night the Christ child was born. If a family's Christmas tree contained a birds nest, they would be granted the gift of health, wealth and happiness throughout the year. It is our hope that this little nest adorns your tree and the legend may come true for you! May your harvest be bountiful for all my US readers! 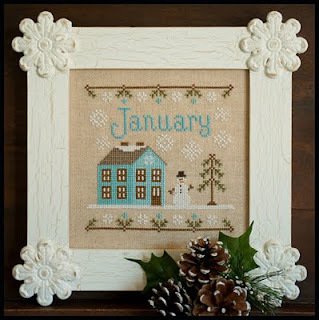 Let me tell you when I read over at Country Cottage Needleworks , that Nikki was designing a monthly Cottage starting December 2011, and then I saw how cute the first installment was...well, sign me up buster! I love, love, love houses. I don't know why, maybe its because I'm built like one, but enjoy them I sure do. Throw in key phrases like *seasons* and *series*....well that pushes some mental buttons for me. I automatically start thinking....thinking....thinking.... then I start, well obsessing. I. have. to. do. it. So...here's the deal. I'm going to start a Stitch-A-Long Blog. These will all be 75 x 75 inches and I've got dimensions all figured out for if you stitch them as singles or as one big piece. Care to think what I'm doing? Ha. Ha. Ha. Go crazy right along with me and join today! The linen is very stiff...but that is why the stitching looks 3-Dimensional as it is fabulous as far as holding the stitches and maintaining and even tension with the stitches. (Which I got smacked on the hand about by the Fair Judge this summer - that I had areas of "uneven tension" in my stitching....which I think was due to the fabric but...I'm trying to become a better stitcher so am paying extra close attention to my stitches and their tension - this fabric makes it very easy to have perfect stitches). And may I also say, the stiffness and almost like slippery surface making picking the stitches out (which I had a large experience with on Snow Friends) very easy too! ﻿Here's where my entire project stands as of this moment. I am stitching all 6 Fat Men on one piece of linen and I've got lots of ideas about how to finish this seasonal cutie. I love to decorate our home "with the seasons" so this one won't be framed as it will only be out for one part of the year. But like I've said, I'm spinning around different options in my brain each time I stitch on it. So have I sold you guys on these handsome fatties? :) If not, how can I get you to capitulate? These are so fun to stitch, sort of just easy, ya know?! And after something as hard as the Quaker Virtues page I just got done stitching, easy peasy made for a nice change. I have really fallen for this Amber Linen, both in texture and color. So much so I bought some more of it (1 yard) for another project that I am starting over. Here's a little secret.....I started BBD's Anniversaries of the Heart last year. I struggled with linen colors as you know we didn't see all of the designs and that first design was so muted in colors and tone. Well anyway...I did January's and February's designs and just didn't like the way they looked on the linen I chose. I kept on thinking how pretty the color of the linen is against the colors and I kept thinking about the projects that I want to work on in 2012 (I know....) and I just bit the bullet and bought a yard and am going to start January's design well....in January. But you know how I am with my big ideas that never come to fruition....so I'm just zipping my lip and we'll see what January brings. so until next time I'll be keeping my hands to work and heart to God, just like always!